Enter for your chance to win a Summer Travel Prize Pack worth $1,000. 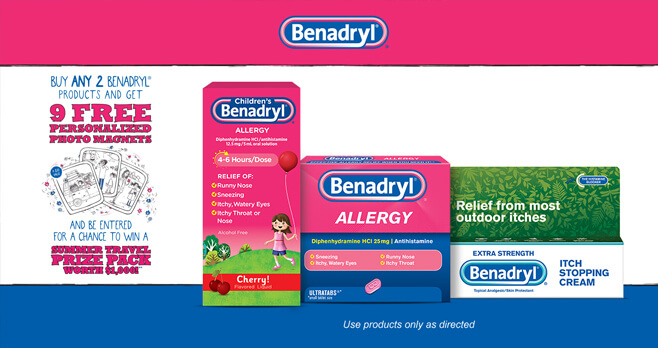 Plus, buy any 2 BENADRYL products and get 9 FREE personalized photo magnets. Ends: September 30, 2018 at 11:59 p.m. ET. Prize: $500 VISA Digital Prepaid Reward and $500 Airbnb Gift Code. Eligibility: Open only to legal residents of the 50 United States and the District of Columbia who are at least 18 years old or of the age of majority in their state of residence at the time of entry. Skittles Awesomest Summer Party Sweepstakes (Summer.Skittles.com): Snap. Text. Win!